Imagine the pain of saying no to tetra pack juices and donuts for diabetic patients. However, this does not indicate the end of their world as they can still enjoy living on milk, fruits, raw veggies, oats, barley and more. But what health experts have found really worth mentioning is the importance of consuming millets. What they ensure are a balanced diet, energy boosting capabilities, and blood sugar control. Millets are rich in protein, fiber, magnesium, and calcium that help in controlling blood sugar to a good extent. Moreover, these gluten-free grains can be a perfect addition to one’s diet to keep diabetes at bay. Also, what’s best about millets is that they supplement the diet with phytochemicals and minerals that combine to beat diabetes. Fiber on the other hand aids in releasing sugar slowly into the blood after the breakdown of food. Apart from this, insulin sensitivity is improved where the sugar released into the blood is used up, keeping the blood sugar controlled. Finger Millet – Rich in calcium, this brown colored millet is also known as Nachni or Ragi. Moreover, calcium regulates the release of the hormone insulin. This helps in managing the level of blood sugar. However, you must avoid ragi bread, ragi biscuits or ragi laddoo as they contain unwanted sugar, fats, and wheat flour. Pearl Millet – Being a rich source of iron, Pearl millet or Bajra plays a key role in controlling diabetes. As people with iron deficiency fall prey to diabetes, pearl millet can be quite helpful as it also acts as a fat burner leading to better weight management. Therefore, adding pearl millet to your diet will help you stay away from the risks of diabetes. Little Millet – As the name goes, it is very small in size and white in color. What is best about Varai is that it swells on cooking as it absorbs water. One cup of raw Varai will be equivalent to 3 cups of cooked varai. If one wishes, one can add Little millet to any type of vegetable. As a result, the quantity consumed will be more. Moreover, it is rich in zinc and will, therefore, help in controlling your blood sugar level. In other words, it is a great substitution for rice and semolina. Sorghum – One of the key reasons why one should go for Sorghum or what is popularly known as Jowar is its high content of Magnesium. Known to secrete insulin, Sorghum will help in insulin resistance. Kodo millet – It is one of the rarest types of millets that contain a high content of copper. So consuming it as part of your diet will result in damaging sugar tolerance in your body. So having kodo millets is best for diabetic patients. Who can deny the pleasure of eating rice on a daily basis? However, the story is not the same as people who are suffering from diabetes. The more they avoid wheat and rice, the better it is. So, unprocessed food cannot be a wise solution in this respect. Here comes millet that will never give you the feel of missing tasty food. Rather, these mighty grains are rich in texture and flavor that will not only satiate your taste buds but also keep you fit and fine. Wheat and rice are usually consumed in processed form. Millets can, however, be used in the form of flour. What one needs to ensure that the entire millet is grounded with the bran as it comes packed with vitamins and minerals. These would help you fight back against health complications like diabetes. 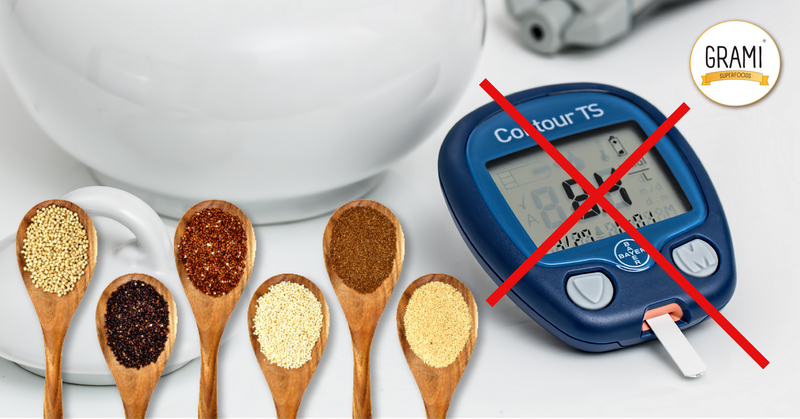 A person with diabetes must never consume carbohydrates alongside foods having a high content of the glycemic index. Therefore, it would be best if porridge made of millets or someone cooked with other whole grains can be consumed. At breakfast, millets can be taken three to four times a week. This energy-producing grain gives 26.4% of the daily value for magnesium resulting in insulin secretion and glucose levels. It is also known to eliminate the chances for lower cholesterol, type II diabetes, and also prevent gallstones. Moreover, it is high in phosphorous, fiber, and is gluten-free as well. Millets are rich in B vitamins, zinc, magnesium, calcium and iron. Helps to reduce risks of heart disease and type 2 diabetes. As millets are a great source of starch, consuming these will add a high dose of energy to your body. They are an excellent source of protein and fiber. Millets are pest-free and are therefore harmless for your health. Imagine the pain of saying no to tetra pack juices and donuts for diabetic patients. However, this does not indicate the end of their world as they can still enjoy living on milk, fruits, raw veggies, oats, barley and more.